…is worried she is going to become fat like us Americans. Now we definitely have an American child diet in this house…pasta (because Matthew will eat nearly any kind of sauce or cheese covered pasta)…mac & cheese (again pasta but of the cheesy variety)…carbs (chicken nuggets, tater tots)…cereal or donuts for breakfast…and (because I need to fatten Matthew up) an assortment of cookies,candies, snack foods. Earlier this week she had her first glazed donut…then, tonight I made waffles cuz Matthew has been asking for them. 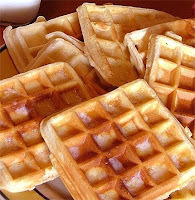 Now this is not like a 15 ingredient, home made waffles…they could only be easier if they were the frozen EGGO brand. But, pre-bought, COSTCO mix in the large bag, mixed with water and oil and plop into the waffle iron and drizzle (smother in Matthew’s case) with Maple syrup. When I sat the kids down, she initially said she didn’t want any. Then, she was intrigued by what I was making (I usually triple the batch so I can freeze some for a quick breakfast for the kids on school mornings). I turned around and she started taking over for me in making in them and then I saw her trying a piece of one (without syrup so she hasn’t gotten the total effect!). She turns to me and with this distressed tone in her voice says…”it is soooo delicious!”. (I tried to reassure her that if she continues to keep trying to keep up with Riley and all of his walking / bike riding, she should be okay).